Schizophrenia is a chronic, severe, and disabling brain disease. About one-third of all patients with schizophrenia do not respond adequately to drug treatment. Advances in neuroscience and clinical research have led to the introduction of a novel generation of compounds with neuroprotective properties. Despite numerous animal studies with promising neuroprotective agents, no successful strategy for neuroprotection from functional psychoses has been successfully demonstrated. There are two main targets for neuroprotective therapy: (1) neurodegenerative processes in schizophrenia (e.g. apoptosis, excitotoxicity, oxidative stress, stress sensitization, and alteration of neurosteroids); and (2) phenotypic presentations of illness including psychopathological symptoms, significant decline in cognition, psychosocial functioning and in health related quality of life (HRQL). 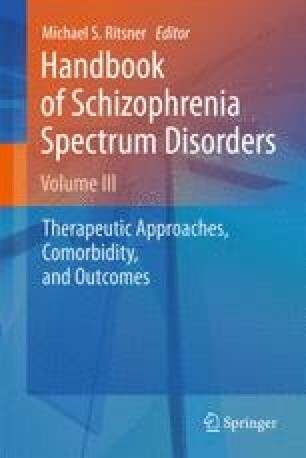 In this chapter substantial information about clinical trials with neurosteroids, vitamins, and some herbal supplements with neuroprotective properties in schizophrenia is presented. Neurosteroids such as pregnenolone (PREG), dehydroepiandrosterone (DHEA) and their sulfates (PREGS and DHEAS) are reported to have a modulatory effect on neuronal excitability and synaptic plasticity. In addition, vitamins and herbal supplements are important for regular cell function, growth and development. As a rule, vitamins promote the activity of enzymes to improve their efficiency and in this role they are called coenzymes. The herbal supplements are active antioxidants with neuroptective properties. The authors hope that neuroprotective strategies will pave the way to the next generation of antipsychotic, sedative and mood stabilizer medications. The clinical effects of neuroprotective agents clearly merit further clinical trials for the treatment of mental disorders. We thank our collaborators Dr. Anatoly Gibel, Dr. Ekateryna Kovalyonok, Dr. Chanoch Miodownik, Dr. Yael Ratner, Dr. Tatyana Shleifer and Professor Abraham Weizman in the reviewed studies for fruitful cooperation. DHEA, L-theanine and vitamin B6 studies were supported by grants from the Stanley Foundation.